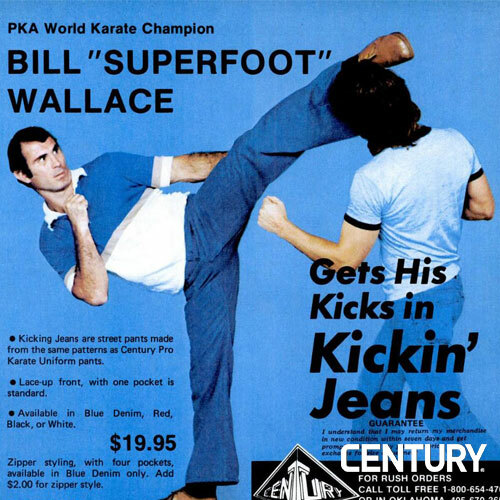 Several well-known martial artists like Bill “Superfoot” Wallace and Ernie Reyes Sr. made appearances in Action Jeans ads. 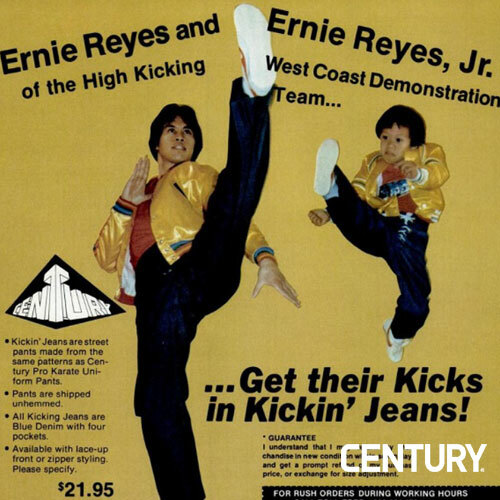 One ad in particular features Reyes and his son, Ernie Reyes Jr., then just a child, both poised mid-high kick in the jeans (this was long before the younger Reyes would reach the height of his kickboxing prowess and movie star fame). Action Jeans had a good run, from 1977 to 1991. Then the line was retired, to the disappointment of denim-wearing high-kick aficionados everywhere. But they say you can’t keep a good man down, and apparently, you can’t keep a good pair of jeans down either. Twenty-plus years since the jeans had discontinued, people were still talking about them, trying to find a pair for sale. And so, from the ashes of the Action Jeans rose the Kicking Jeans. Century re-introduced the popular pants in 2015 at the Martial Arts SuperShow in Las Vegas, new and better than ever! Kicking Jeans are made from a blend of denim and Elastane fibers, which, in nontechnical terms, means “really stretchy fabric.” The Kicking Jeans look and feel like normal jeans, though, not Spandex or any other “jegging” material. No, Kicking Jeans are in no way related to jeggings, unless it’s as an older, and much cooler, cousin. 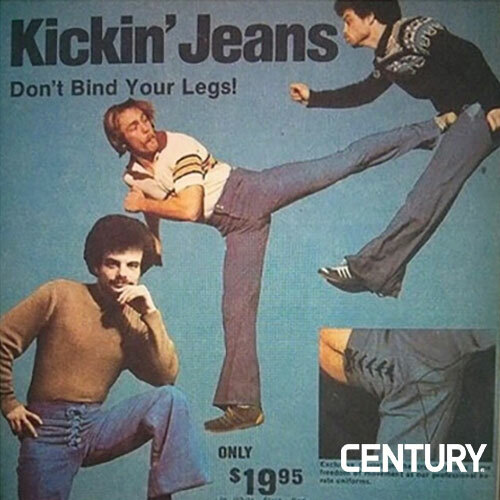 What made the jeans unique at the time, and what still makes them Facebook-post-worthy today, is that you can conceivably kick someone in the head while wearing them. They’re that flexible. They’re the jeans equivalent of the one little show-off kid we all knew who did gymnastics in grade school and could contort her body like a pretzel. Century Martial Arts has a variety of products for your martial arts training needs. From uniforms, belts, sparring gear, training bags, fitness equipment, and more.